Nestled between the rowdy Street Fighter V stage and a rather impressive Monster Hunter airship at Capcom's E3 2016 sat an orange-tinted oasis of calm, in the Tibetan-esque temple of justice dedicated to Phoenix Wright's latest lawyerly adventure: Ace Attorney: Spirit of Justice. We had the chance to go hands-on with a 20-minute demo that took us midway into an early case, and had a blast exploring the ins and outs of this latest Ace Attorney, including its brand new backdrop and fresh Divination Séance mechanic. The first thing that jumped out at us on picking up the 3DS was the fantastic new setting, in the not-fooling-anyone, totally-Tibetan 'Kingdom of Khura'in'. Even though our demo was mostly confined to the courtroom, we still saw plenty of colourful swatches of prayer-flag fabric, bright orange columns, Buddhist-inspired decorative designs and faux-Himalayan script, and it was a welcome shakeup from the norm that had us excited to see more Khura'inese culture. We weren't the only ones affected by the new surroundings, either; not only does everyone in the Kingdom seem to have a particularly strong hatred of lawyers, but the courtroom rules are also quite different, and Phoenix looks to be in for a serious bout of legal culture shock. 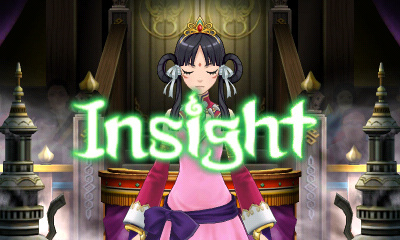 The biggest switch-up we saw in the demo came in the form of Divination Séances, a ritual enacted by Khura'inese Princess Rayfa Padma which let us (and all present in the closed-door courtroom) see the victim's final memories from right before their death. The Séance plays out in the form of a video, seen from a first-person perspective, where everything the victim experienced with their five senses is laid out: the video itself represents sight, of course, while sounds, touches, smells, and tastes are relayed through words which pop up at relevant moments on the screen. In the demo, for instance, the unfortunate victim watched as a young boy held a heavy object up above his head, while phrases like 'A boy's voice', 'Incense', and "Sound of a ritual dance' floated in at certain points. Once the Princess has shown the court one of these Séances, she summarizes the vision into a text-based Insight, which look a lot like the testimonies of traditional trials. And since the Khura'inese legal system treats them as gospel, naturally it's Phoenix's job to poke holes in them by finding any inconsistencies or impossibilities he can. Again, it's similar in concept to looking for contradictions in testimony — which we were also able to do in the demo — but it plays out in a fun new way that we really enjoyed. To debunk these divinations you'll be able to compare the Séance vision to the Insight text simultaneously, through an intuitive interface that reminded us a bit of multitrack video editing: the Séance plays on the top screen, and you can move between five discrete sections of the video-vision using the 'Y' and 'A' buttons, while the Insight text is displayed on the touchscreen, and can be independently cycled through using the D-Pad. When you find something that doesn't match up, cue up the relevant section of the Séance on the top screen and the relevant Insight text on the bottom, and hit 'X'; you'll then get to point out precisely where the problem lies on the touchscreen. In the demo, for example, the Insight made reference to our victim being killed after a certain ritual had concluded, but the Séance showed that he was hearing the sounds of that same ritual right up until his death; we aligned the Insight with a section of the Séance that had 'Sound of a ritual dance' on-screen, tapped those words on the touchscreen when prompted, and promptly put the Princess in her place. We were able to experience several of these Séance takedowns in the demo — before the judge ordered us to wait for the full game to continue our defense — and each was immensely satisfying. Each time, finding the relevant inconsistency took several careful reads of the text and watch-throughs of the video, and — in typical Ace Attorney fashion — the contradictions we eventually found were tiny details, the significance of which only became clear as they added up. These gloriously gratifying gotchas are a hallmark of the series, and we loved the Divination Séances' new multimodal spin on these 'Aha!' moments. Elsewhere, the script seems to be just as charming as ever; Phoenix's internal monologue was appropriately snarky, each character had a distinctive written voice, and Capcom's pun-development department has clearly been working overtime. Spirit of Justice looked great too, with smooth animation, detailed backgrounds, and subtle use of stereoscopic 3D, and we're excited to see more of Khura'in's colourful kingdom in the series' beautiful slightly-cel-shaded style. Happily, we won't have to wait too much longer to take Phoenix back to trial, with Ace Attorney: Spirit of Justice set for a September 2016 release in both North America and Europe. We're definitely looking forward to it; aside from the joy of seeing Mr. Wright back on the 3DS screen, the new on-theme Divination Séance and Insight mechanics were highlights of our time with the demo, and we can't wait to take down more divinations in the full game. My biggest complaint about Dual Destinies was that it was too easy (the game constantly threw hints at you, and Athena's Mood Matrix was pretty much OP), but these new mechanics sound like they have the potential to up the complexity a good deal. I'm loving the sound of it. When will the demo be out on eshop? I sincerely hope this gets a physical release. I am a huge fan of this series, although I did not enjoy parts 4 or 5 nearly as much as the original trilogy - I don't think I ever finished them. I am so completely sad that they did not release the olde-tyme Japanese style game in English. I think what made the series stale for me was the same characters and settings over and over and over. Awesome, sounds like a great time to hop onto the Phoenix Wright fan train . 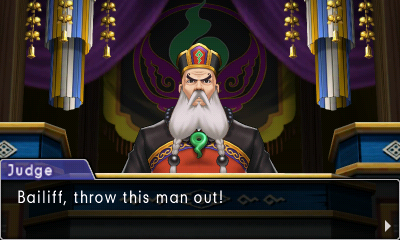 I'd like to see Great Ace Attorney localized before this. It feels to me like they're trying to unify the universe with the localization. The Feys were totally not a clan of some fantasy channeler mikos native to Japan, because we're in California see? They were totally originally from this weird country, see? Eat your hamburgers Apollo. I will be keeping an eye on this game. It all depends on the price on whether I download this game or not. It's good to see that the pun department is doing well. I hope this game won't get the same age rating as Dual Destinies. Your only hope for an English-language physical release is if Limited Run Games gets hold of it. They're trying to make arrangments for a physical release of dual destinies. I love Ace Attorney games, but I have yet to play Dual Destinies, but I'll sooner or later. I would love to try these games (I loved the Dual Destinies demo from a while ago), but not until there's some sort of physical release. @Trinexx Carmen San Diego, is that you? 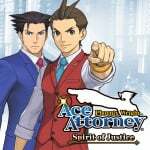 Hey Capcom, if you could rerelease Apollo Justice on the eShop, that'd be great. Kind of a lame subtitle this time tbh. I neeeeddd that demo in my life asap. In other words: "Capcom's continuing contempt for it's own fanbase." Nothing we haven't already figured out. @Pokefanmum82 With the, current, exchange rate that's only 3 dollars more than the US version. @MrCafecito That exchange rate is just outrageous! I would have imported, If I had the chance with those prices. @Nin10doh then what's $59.99? because that's the price that most preorders are going for in Canada. Good thing I preordered during E3 when Amazon had a 20% off deal. Haha, man I used to love that show when I was younger. Now I feel kinda old. I remember when they made it a game show. @Kalmaro: I really loved playing the games (especially the Where In Time series), and I remember there being a game show. Now I feel old too lol. Oh I can't take that voice acting. I'm going to have to import this one.